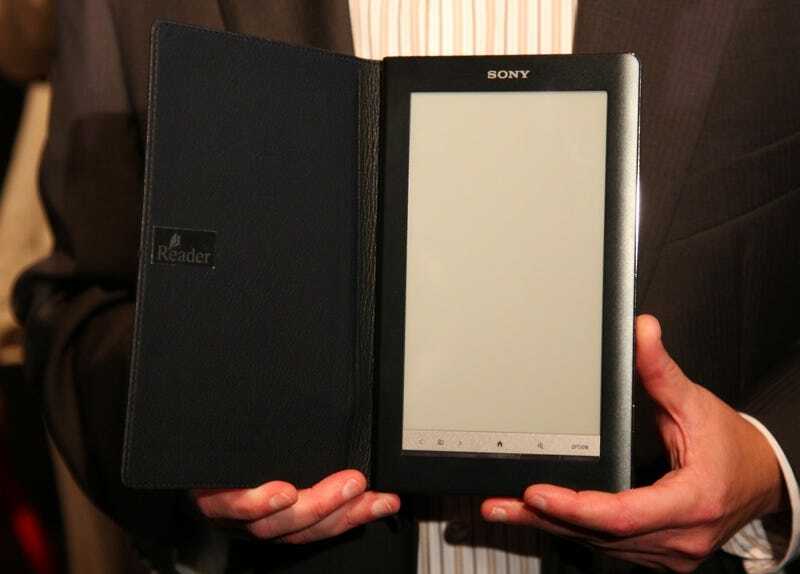 It's what we thought; The Sony Daily Edition reader is Sony's first (AT&T) 3G reader with a seven-inch touch widescreen display that you can rotate to view books in landscape. It'll be available in December for $399. Updated. But yeah, check out how crazy wide that display is. Newspaper content announcement is coming later, unfortunately—as in weeks later, not later today. Also unfortunately, Sony only brought one model and we can't touch it. And while 3G will be free, just like the Kindle, wireless access only gets you access to Sony's book store, none of the other new partnerships announced. Boooo. One saving grace? The electronic library program: The eBook store will now have a Library Finder page, where you type in your zip and it'll take you to local library, where you can check out books from your library electronically. Books will expire in 21 days. They're taking the "virtual library" concept fairly literally here, so libraries will have to purchase licenses for each individual copy, which is loaned and returned in the same way as a physical one would be. That means a library will have a limited stock of virtual books—weird, I know—all licensed from an outside company called Overdrive. We'll have to see what the selection is like before getting too excited about this, but it's a pretty cool concept. And hey, free books! Also, anybody else disappointed there's no Barnes & Noble partnership to really fight the Amazon book Borg? NEW YORK, August 25, 2009 ¾ Delivering on its promise to give consumers a variety of choices, Sony today announced the third member of its new Reader family – the Reader Daily Edition™, a highly-anticipated wireless model with 3G connectivity. The Daily Edition caps its new line of Reader products, joining the Reader Pocket Edition™ and the Reader Touch Edition™ which were announced earlier this month. The Reader Pocket Edition and the Reader Touch Edition are available immediately, and the Reader Daily Edition will be available this December in time for the holidays at SonyStyle stores and SonyStyle.com. "We firmly believe consumers should have choice in every aspect of their digital reading experience," said Steve Haber, president of Sony's Digital Reading Business Division. "Today, we take another large stride to deliver on that promise. We now have the most affordable devices on the market, the greatest access to free and affordable eBooks through The eBook Store from Sony and our affiliated ecosystem, and now round out our Reader offering with a wireless device that lets consumer purchase and download content on the go." The Reader Pocket Edition sports a five-inch electronic paper display packaged in a stylish chassis and is available in a variety of colors, including navy blue, rose and silver. It is available for the ground-breaking price of $199, making it the most affordable dedicated reading device on the market. The Reader Touch Edition features a responsive, menu-driven six-inch touch screen panel that enables quick, intuitive navigation, page turning, highlighting and note taking with the swipe of a finger or by using the included stylus pen. It comes in red, black or silver and retails for about $299. The Reader Daily Edition gives consumers wireless access via AT&T's 3G mobile broadband network to Sony's eBook store from just about anywhere in the U.S. Book lovers will be able to browse, purchase and download books as well as select newspapers and magazines when and where they want. There are no monthly fees or transaction charges for the basic wireless connectivity and users still have the option to side load personal documents or content from other compatible sites via USB. The seven-inch wide, touch screen display provides for intuitive navigation and comfortable layout of content, including newspapers and magazines, whether you're reading in portrait or landscape orientation. In portrait mode, about 30-35 lines of text are visible, making the experience very similar to that of a printed paperback book. A high contrast ratio with 16 levels of grayscale ensures that text and images are crisp and easy to read. The Daily Edition also boasts an attractive aluminum body with an integrated cover for durability. It has enough internal memory to hold more than one thousand standard eBooks and expansion slots for memory cards to hold even more. It will sell for about $399. All three models feature Sony's award-winning industrial design and an E Ink® Vizplex™ electronic paper display that emulates the look of ink on paper. Sony's eBook Library software 3.0, which now includes support for many Apple® Macintosh® computers as well as PCs, makes it easy to transfer and read any Adobe® PDF (with reflow capability), EPUB, Microsoft® Word®, BBeB® files, or other text file formats on the Reader. In addition to announcing a new family of Readers, Sony has also made several changes and improvements to its eBook Store to provide better access to an even greater variety of ebooks. Earlier this summer Sony announced the availability of more than one million free public domain books from Google, and the company made new releases and New York Times bestseller titles available for $9.99. Today also marks the launch of Sony's Library Finder application. Sony, working with OverDrive (www.overdrive.com), the leading global digital distributor of eBooks and to libraries, will now offer visitors to the eBook Store by Sony easy access to their local library's collection of eBooks. Thousands of libraries in the OverDrive network offer eBooks optimized for the Sony Reader, and visitors can now find these libraries by typing their zip code into the Library Finder. Through the selected library's download website, visitors can check out eBooks with a valid library card, download them to a PC and transfer to their Reader. At the end of the library's lending period, eBooks simply expire, so there are never any late fees. The Reader Pocket and Touch Editions, as well as available accessories such as AC adaptors, cases and covers with reading lights, are available now at SonyStyle.com and SonyStyle stores. Book lovers interested in trying out a Reader in person will also be able to find them for sale at Best Buy, BJs, Borders, Sam's Club, Staples, Target, Toys"R"Us, Wal-Mart and other authorized retailers nationwide. NEW YORK, August 25, 2009 ¾ Further evidence of the broad support for its open approach to digital reading, Sony today announced relationships with a variety of traditional and digital publishers who provide content in industry standard formats to create a universe of reading material compatible with the Reader. All of these sites will offer content in the EPUB format, the International Digital Publishing Forum's (IDPF) XML-based standard format for reflowable digital books and publications. EPUB has gained acceptance among major trade book publishers with dozens of publishers already producing the majority of their eBooks using the standard. Sony recently announced that the company is transitioning its entire content library to the EPUB format, giving consumers the freedom to purchase or download free eBooks from the eBook Store by Sony and read them on any EPUB-compatible device. "From the beginning, we have said that an open format means more choice for consumers," said Steve Haber, president of Sony's Digital Reading Business Division. "Now, working with other industry leaders, we can provide a device that is compatible with the widest selection of content available. Readers can shop around for what interests them rather than be locked into one store." Sony's eBook Store already provides access to more than one million public domain Google Books in EPUB format and, starting today, Sony's Library Finder application will go live. Library Finder offers visitors to the eBook Store by Sony easy access to their local library's collection of eBooks. Thousands of libraries offer eBooks optimized for the Sony Reader, and visitors can now find these libraries by typing their zip code into the Library Finder. Through the selected library's download website, visitors can check out eBooks with a valid library card, download them to a PC and transfer to their Reader. * Independent Bookstores – More than 200 participating members of the American Booksellers Association-including stores such as Tattered Cover (Denver, CO) and Vroman's Bookstore (Pasadena, CA)-will have the ability to sell e-content to consumers beginning this fall. The stores using ABA's IndieCommerce platform will offer content in the EPUB format and protected by Adobe's Content Server 4 (ACS4) digital rights management, which is compatible with Sony e-Reader products. In addition, plans are underway to make Sony's e-Reader devices available for purchase from independent bookstores in time for this holiday season. ABA is a not-for-profit trade organization devoted to meeting the needs of its core members – independently owned bookstores with storefront locations – through education, information dissemination, business products and services, and advocacy. · BooksOnBoard – BooksOnBoard, the largest independent eBook bookseller and member of both the ABA and IDPF, has been a staunch supporter of the EPUB standard through its founder Bob Livolsi. BooksOnBoard was the first eBook site to offer the EPUB standard to its burgeoning customer base and has sold more EPUB formatted books than any other online bookstore. BooksOnBoard believes that the EPUB standard significantly benefits the publisher, authors and most importantly the consumer. · NetGalley – NetGalley is an innovative and easy-to-use online service and connection point for book publishers, reviewers, media, librarians, booksellers, bloggers and educators. NetGalley delivers digital galleys and promotional materials to professional readers and helps promote new and upcoming titles. Starting today, NetGalley will support the Reader with the ability to download a protected PDF file and this fall the company will offer digital galleys in EPUB format. * Powell's Books and Powells.com – Powell's Books is the largest independent bookseller in the world. Innovative since its inception in 1971, it was one of the first booksellers online (beginning in 1994), and one of the first to sell eBooks for reading devices (the Rocket eBook) in 1999. Powell's offers EPUB content for a wide range of compatible devices, including the Sony line. Powell's is an important player in the open access world of eBooks, where titles are provided by a wide range of publishers in a competitive retail environment, read on a range of devices, and downloaded and owned by millions of people around the world.